The mission of AEIOU Medical is to improve the targeting of medical care for the prevention of low-trauma fractures. We hope to reduce the high costs of preventing and treating low trauma fractures, most of which occur in cortical bone. These excessive costs derive in large part from the inability of current techniques for diagnosing osteoporosis and estimating fracture risk to reliably identify in advance individuals who later suffer low trauma fractures. Our patent-pending Cortical Bone Mechanics Technology™ (CBMT) accurately determines the strength of cortical bone (R2 = 0.99). Accordingly, AEIOU has received an award of $477,000 from the National Institute on Aging to develop CBMT™ as a non-invasive medical device. We will be conducting clinical trials to investigate whether targeting fracture preventive care at individuals identified by this device as having weak cortical bone will substantially reduce the incidence of low trauma fractures. The AEIOU Medical device measures the mechanical properties of cortical bone in living persons. 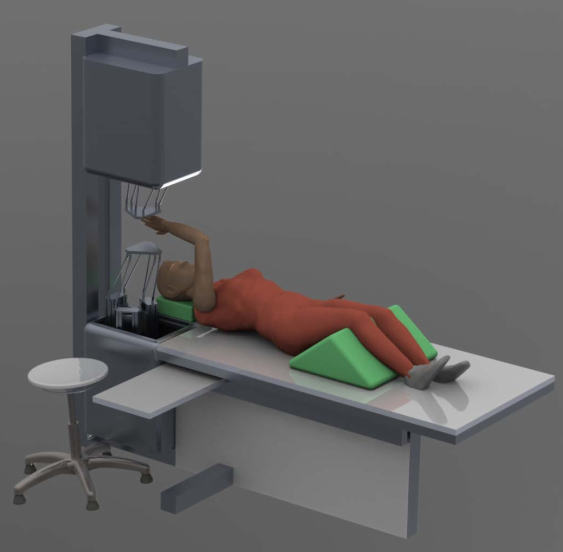 It performs a non-invasive, dynamic, 3-point bending test by applying oscillatory forces via a blunt probe to the skin overlying the ulna bone in the forearm, measuring the resulting oscillatory acceleration of the probe, analyzing these force and acceleration signals to measure ulna bending mass, stiffness, and damping, and calculating the quality factor, flexural rigidity and bending strength of cortical bone tissue in the ulna. The AEIOU Medical device is intended for use by health care professionals to infer the mechanical integrity of cortical bone in the ulna. It is indicated for use to estimate bending stiffness, damping, and mass, quality factor, flexural rigidity, and bending strength of the ulna. The AEIOU Medical device has been accepted by the Ohio University Biomedical Institutional Review Board as a non-significant risk (NSR) investigational device. As such, it is deemed by the FDA to have an Investigational Device Exemption (IDE) for use in OU IRB-approved clinical trials of its safety and effectiveness.